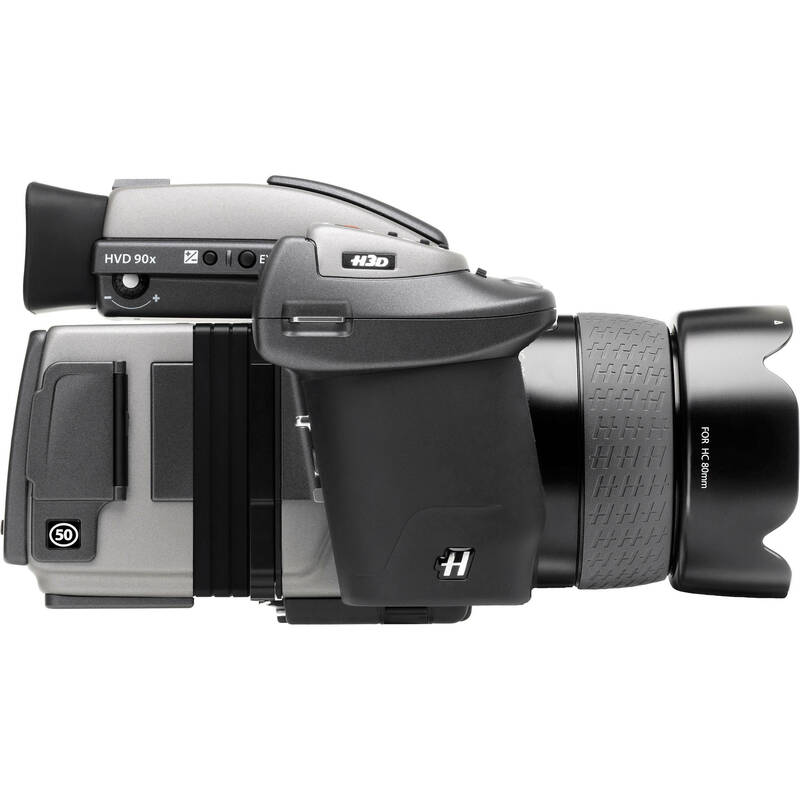 The Hasselblad H3DII-50MS is the ultimate in H System cameras. The H3DII-50MS has all the features of the H3DII50, and adds Hasselblad Multi-Shot technology combined with new image processing software, making the H3DII-50MS the ultimate in digital photography. It features the Kodak 50 Mpixel sensor, measuring 36 x 48mm, and is designed to meet the exacting demands of high-end commercial photographers who require the pinnacle of both image quality and performance. The camera takes full advantage of the virtues of medium format photography providing system flexibility for the professional photographer, including the freedom to choose between eyelevel and waist-level viewfinders, digitally APO corrected lenses, and even shift/tilt lens options. The camera provides a basic ISO rating from ISO 50 to ISO 400, and using Hasselblad's Phocus software, allows the user to further bump up the ISO to ISO 800. The H3DII-50 also makes use of a proprietary high speed capture architecture capturing full size, compressed 65 megabyte images at an impressive rate of 1.1 seconds per capture when working either mobile or tethered to a computer. Furthermore, Hasselblad's Natural Color Solution delivers superb out-of-the-box color quality with skin tones, specific product colors and other difficult tones reproduced easily and effectively. The camera records images in a raw file format called 3F RAW (3FR), which includes lossless image compression, or users can record images in a fully formatted and uncompressed TIFF Format (8-bit). The camera also incorporates Hasselblad's unique Instant Approval Architecture (IAA), which provides an enhanced set of feedback tools and an on-the-fly image classification system, designed to enable the photographer to focus on the shoot rather than the selection process. The H3DII is the 5th generation of the Hasselblad H-system, and provides improved controls and functionality, better sensor cooling, a more intuitive user interface, and a bright, 3" display. When combined with the latest Hasselblad's image processing software - Phocus by Hasselblad - H3DII sets the standard for digital photographic quality. With a range of techniques and features, it provides the power and finesse needed to serve and support the latest Hasselblad camera developments and to enable groundbreaking levels of image quality - all in a modern and easy-to-use environment. Providing a hereto unseen level of image detail, the H3DII-50MS camera uses the KODAK KAF-50100 CCD Image Sensor. This four output, high performance CCD has a resolution of 50 Megapixels (8176 x 6132) with an active area measuring 36.8 x 49.1mm, and incorporates the latest in noise reduction and anti-blooming protection technology. Information about the lens and exact capture conditions is fed to the camera processor for ultra-fine-tuning of the auto-focus mechanism, taking into account the design specifications of the lens and the optical specifications of the sensor. In this way the full HC lens program is enhanced to perform at a new level of sharpness and resolution. Digital correction for color aberration and distortion is also added. Digital APO Correction (DAC) is an APO-chromatic correction of the images based on a combination of the various parameters concerning each specific lens for each specific shot, ensuring that each image represents the best that your equipment can produce. Optimum portability and image storage are critical for the professional photographer. 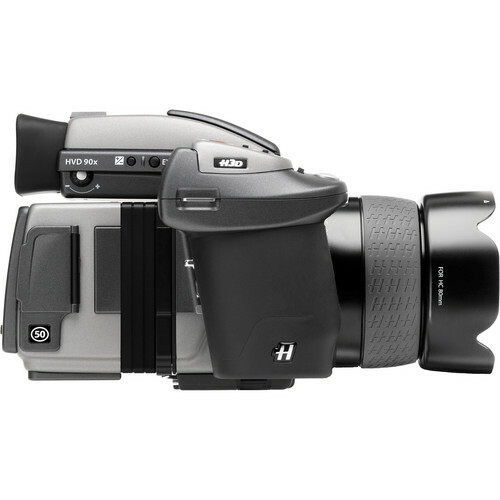 The Hasselblad H3DII offers a choice of storage devices: portable CF card storage, the flexible Firewire driven Hasselblad Imagebank or tethered operation with extended, special capture controls, and image capture directly to a computer hard drive. With these three operating and storage options, you are able to select a mode to suit the nature of the work in hand, whether in the studio or on location. Normally troublesome subjects such as various skin tones, metals, fabrics, flowers, etc. are easily captured by using the powerful color profile - the Hasselblad Natural Color Solution (HNCS). It works invisibly in the background in conjunction with the FlexColor imaging software, producing outstanding and reliable out-of-the-box results. In order to support our new unique color system, we have developed a custom Hasselblad raw file format called 3F RAW (3FR). The file format includes lossless image compression, which reduces the required storage space by 33%. 3FR files can be converted into Adobe's raw image format DNG (Digital NeGative). In order to optimize the colors of the DNG file format, conversion from the 3FR must take place through FlexColor. The DNG file format enables RAW image files to be opened directly in Adobe Photoshop. Hasselblad image files carry a full set of metadata, including capture conditions, keywords and copyright, facilitating workflow with image asset management solutions. Building on the success of its Audio Exposure Feedback technology, Hasselblad has created Instant Approval Architecture (IAA), an enhanced set of feedback tools, designed to liberate the photographer from the selection process and to concentrate on the shoot. Audible and visible signals as well as recorded information in the file and in the file name all promote a quick and easy classification in the field or in the lab. Sorting becomes automatic, accessible and very fast, facilitating reviewing the best images for immediate client presentation. Hasselblad's Global Image Locator (GIL) is an accessory to any H-based Hasselblad digital capture product. Using the GIL device all images captured outside are tagged with GPS coordinates, time and altitude. This data is key to a number of future applications involving image archiving and retrieval. One example is the direct mapping of images within the Phocus software to Google Earth. One of the important traditional advantages of medium format is the extra large and bright viewfinder image. The H3DII-50 comes with the HVD90X viewfinder designed for full performance over the large 36.7 x 49.0mm sensor. It is interchangeable with the HV90X viewfinder and the HVM waist-level viewfinder. For increased usefulness, the digital capture unit of the H3DII-39 can also be detached and used on a view camera by way of an adapter. In this case the unit is controlled by the flash sync signal from the view camera shutter. A clean and dust-free sensor is essential and the modular design of the camera allows for easy access for cleaning, saving you hours of retouching work later. FlexColor offers an image processing workflow with the highest degree of control for the studio photographer. In tethered operation, tools like overlay masking help bring productivity to advanced set composition, and a fully synchronized exposure window provides access to camera settings for exposure time, aperture and ISO. FlexColor also allows the photographer to manipulate color temperature and compare image details across multiple images for precise image selection, and includes enhanced noise reduction algorithms for clear images - every time. Phocus by Hasselblad has been developed and designed to reflect the way that photographers work and to help ensure that you can spend as much time as possible taking images - not processing them. Some of the features of Phocus include Moiré Removal (performed directly on the raw data) without the need to make special mask selections or other manual procedures, Expanded Metadata that follows the IPTC Core standard with added GPS data functions, Enhanced Tethered Operation Control such as the ability to control the lens drive for focusing when the camera is in a remote position or when the digital capture unit is mounted on a view camera, and a flexible workflow that features easy-to-use options for customizing your set-up to suit a range of different workflow situations. Viewfinder HVD 90x reflex viewfinder with diopter adjustment (-5 to +3.5D).